Sally Lloyd-Jones is the author of several children’s books, including Skip to the Loo, My Darling! A Potty Book and How to Be a Baby . . . by Me, the Big Sister, which was a New York Times bestseller. Sally Lloyd-Jones lives in New York City. David Roberts is the illustrator of many books for children, including The Dunderheads, written by Paul Fleischman, which was short-listed for the Kate Greenaway Medal; The Dumpster Diver, written by Janet S. Wong; and several acclaimed titles by Andrea Beaty, including Rosie Revere, Engineer and Ada Twist, Scientist. Born in Liverpool, he now lives in London. Has there ever been a baby as wicked as this one? 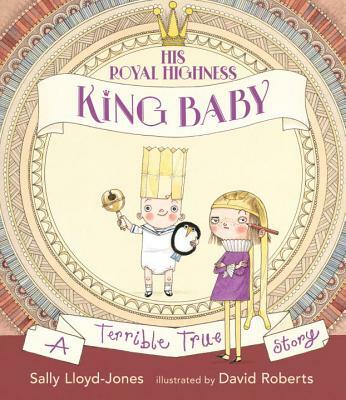 Lloyd-Jones (‘How to Be a Baby … by Me, the Big Sister’) and Roberts (‘Rosie Revere, Engineer’) take the baby-as-royal-tyrant trope out for an exhilarating spin. This displacement-themed fairy tale spoof is funny from the very first page...Comparisons to Kate Beaton’s King Baby and Marla Frazee’s The Boss Baby are natural, but Lloyd-Jones and Roberts’s satire stands on its own. Roberts’ lively mixed-media illustrations humorously play out the sister’s exaggerated version of the events, from the deeply expressive faces to the dense compositions packed with comical details...Many older siblings will relate to this uproarious tale of new-baby mayhem. The newly minted big sister describes, in a classic-fairy-tale narrative style, the havoc wreaked by her demanding baby brother. Even better, she draws the story as she sees it, in entertaining childlike illustrations that mirror—and sometimes humorously deviate from—Roberts’s watercolor and pen art showing the book’s true events. 'Early one morning, a mouse met a wolf, and he was quickly gobbled up.’ It’s a grim start for a picture book, but children acquainted with Jon Klassen’s deadpan illustrations will expect nothing less from ‘The Wolf, the Duck & the Mouse.’ Of course, the mouse gets gobbled. Gobbling, as 4- to 8-year-olds know from ‘I Want My Hat Back’ (2011) and ‘This Is Not My Hat’ (2012), is a Klassen specialty. Ah, but being swallowed by a wolf is only the beginning of the mouse’s adventures in this terrific tale by Mac Barnett. A great book for children with younger “royal” siblings or those who are about to have one. A royal serving of fun for the new-baby shelf.